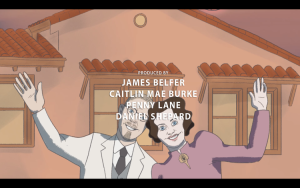 We’ve based this closing credits scene on a real party at the Brinkley Mansion in April of 1937. It sounds like the best party of all time! “[W]hile a stunt pilot did barrel rolls in the opalescent evening sky, fourteen hundred guests milled about the Brinkley estate under a wide web of glowing paper lanterns. Floodlights buried in the bushes produced an effect of ‘intense moonlight, almost as bright as day, such as seen in Japan in the cherry blossom time.’ High-school girls dressed as geishas hoisted seventy pounds of canapes. From a twinkling bandstand a San Antonio hotel orchestra dealt out dance music and the blues. It was the biggest party the doctor ever threw, the biggest south Texas could recall. After short speeches and a big feed, the night was crowned by an apocalyptic fireworks display: dogs, cats, ducks, soldiers on horseback appeared in the heavens etched in flame, each greeted with gasps and applause (Brock, 211).